In contrast to a fairly widespread belief, these exercises had an aesthetic, rather than military purpose. The authors of the sixteenth century, and later, are unanimous on this. According to Fiaschi, not only the “school jumps”, but even the “pesades” were dangerous for the combat horse because, when reared on his hind legs. the animal was in a vulnerable position with respect to the charge of any opponent. … if you want to make some pesades, they should not be very high, because, besides that it would be ugly to see a horse who is accustomed in this way, it would also be detrimental every time that he would behave like this while he’s given encounter, because he could be easily knocked to the ground. This is what I dislike of so many pesades, especially in a war-horse (Fiaschi, 1556, II, 5, p. 99). had an aesthetic, rather than military purpose. 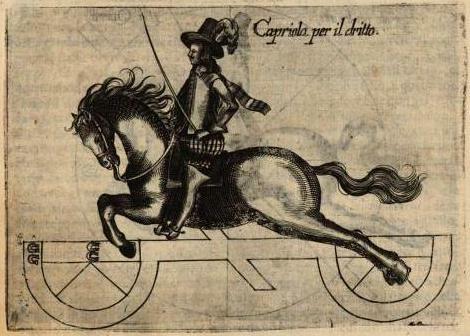 An opinion shared by Claudio Corte, author of Il cavallarizzo (The Horseman, 1562), according to whom the greatest risk was that, once trained to pesades and courbettes, the horse could perform them on it’s own initiative, to evade the control of the rider, leaving him exposed to the attacks of his opponents. Young horses learn pesades easily, and once they have learned them they make them willingly, as they think that once they have done them they do not have to do anything else. For this reason if they are beaten with the spur they think they should not do anything else than stop and make a pesade. So they stop very often to rear against the will of the rider, and in a place where it is not required, and they do it even higher than what it is appropriate (CORTE, 1562, II, 15, p. 71r). considered the pesades harmful to the war horse. Even more explicit about the exclusively ludic purpose of the school jumps and about their harmfulness for war-horses is Pasquale Caracciolo, author of the monumental treatise La Gloria del cavallo (The glory of the horse, 1567). According to the Neapolitan writer and rider, training a horse to jumps, not only made ​​him beautiful to see, but at the same time it increased his agility and sensitivity to the aids. In any case, before the training he recommended to carefully assess the attitudes of the animal, which had to have specific qualities of strength and docility. However, Caracciolo considered it a serious mistake to train a war-horse to these exercises since, according to him, not only they did not produce any benefit in battle, but they could be rather harmful. On the other hand, as Jean-Claude Barry, who for seventeen years was Ecuyer of the Cadre Noir and a leading expert in the work of the “jumpers”, explains well: “knowing the preparation and accuracy they require, it is difficult to imagine performing the airs above the ground during a clash in which rapidity and responsiveness are vital and in which any inaccurate or involuntary action of the rider may be misunderstood by the horse. Moreover the weight of the harness and of the knight in armor was a handicap for the steed restricting his agility “(Barry, 2005, p.26). The cabriole is one of the most spectacular school jumps still practiced . The airs above the ground practiced at that time were slightly different from those still performed today in the great academies of classical equestrian art, like those of Vienna, Saumur, Jerez de la Frontera and Lisbon, which mainly refer to the codification of these exercises that took place in the eighteenth century. Unfortunately, the authors of the Renaissance treatises took it for granted that their readers knew the exercises they spoke about in their books and for this reason they did not dwell on in-depth and clear descriptions. Similarly, with the only exception of the treatise by Cesare Fiaschi, the works of the sixteenth century do not show significant illustrations that can clarify how the various exercises were performed. This makes it now more difficult to pinpoint the specific features of the different types of jumps that are mentioned in the works of the Renaissance masters. 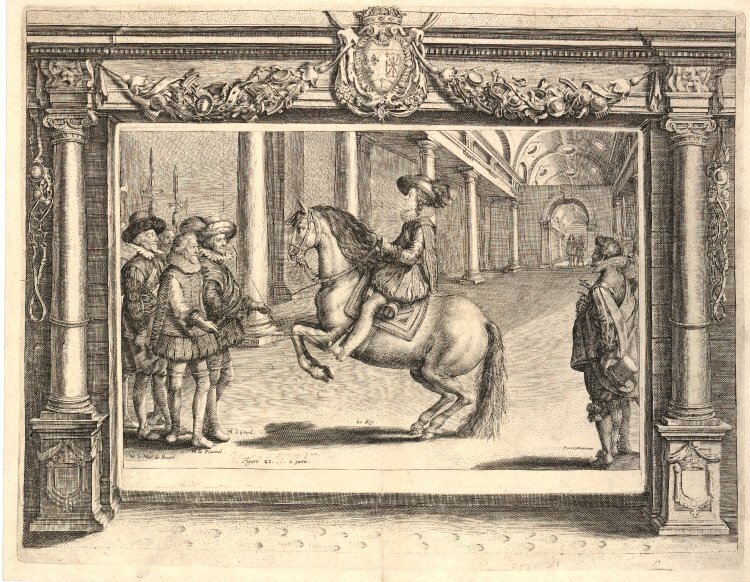 Therefore, in order to make the following description more explicit and precise we will refer to the plates from Fiaschi’s book, as well as to those published in later works, such as the one by the Duke of Newcastle, and as Il cavallo da maneggio (The manège horse), by the Neapolitan count Giovanni Battista Galiberto, colonel and master of riding in the service of King Ferdinand IV of Hungary and Bohemia. 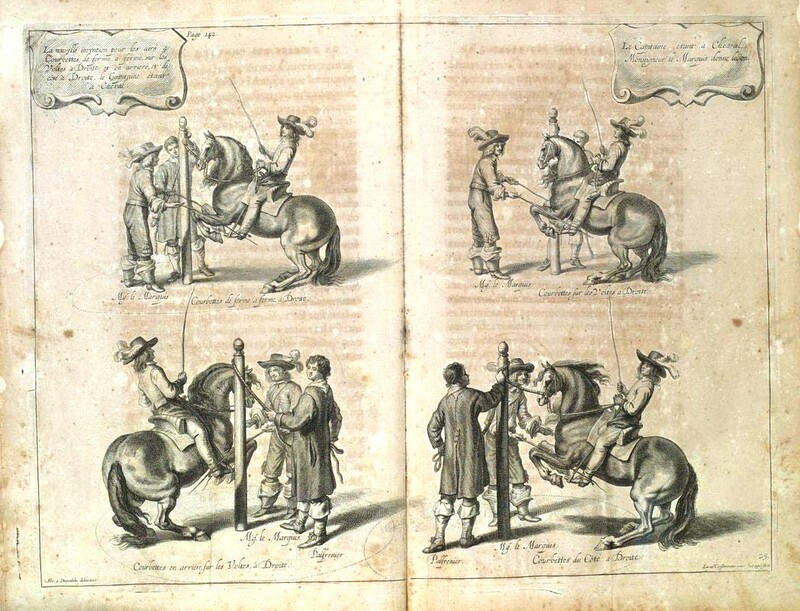 Although the work was published in Vienna in 1650, exactly a century after that of Grisone, it clearly refers to the terminology and techniques of Renaissance Italian horsemanship. The first “air” mentioned in Fiaschi’s book is the so-called “galoppo raccolto” (collected canter). 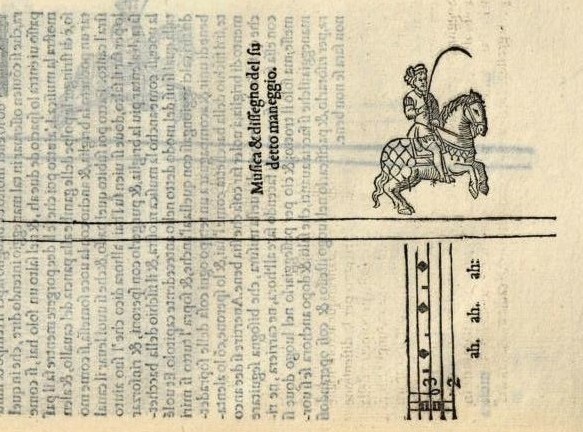 The author does not provide any description of this air, but noting the difficulty of explaining his execution, in words or with a design, he adds the score, specifying that “this measure and time should be respected if you want that the rider makes a group which is beautiful to see” (FIASCHI, 1556, II, 11, p. 114). With the verb “aggruppare” (to group) I think that the author means “perform jumps”, which in other texts are also called “groppi” (probably from “groppa” i.e. croup). 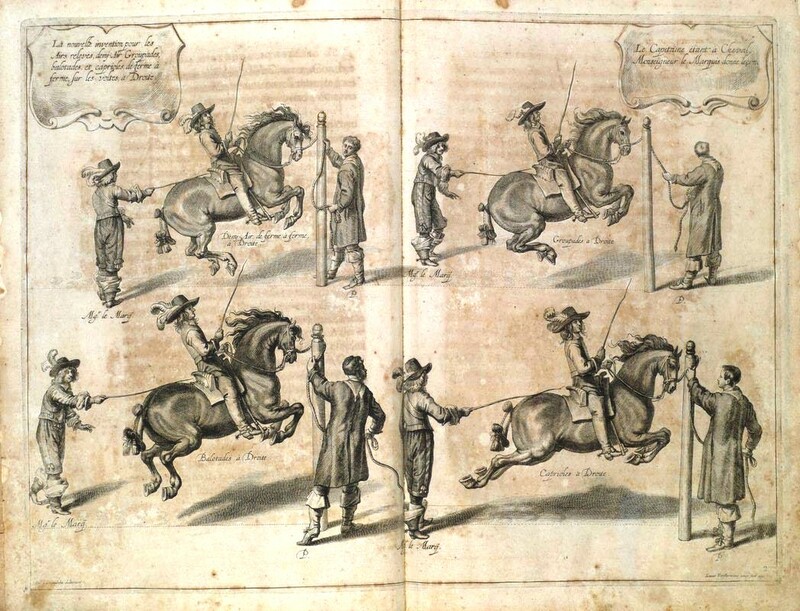 Fiaschi says that to perform this exercise the rider must keep the horse collected, stimulating him with his calves and holding him rhythmically with the bridle, so that “he moves as much as he sways a little bit” (FIASCHI, 1556, II, 11, p. 114). 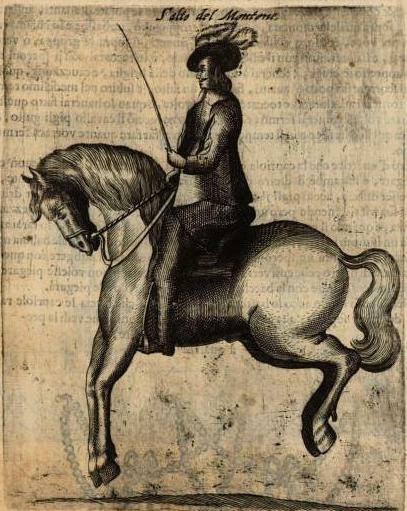 Judging from this information and also from the accompanying illustration, it seems possible to identify the “galoppo raccolto” with what we now call terre à terre, a kind of two beat canter, in which the horse passes alternately from the front to the hind feet and that, since the eighteenth century, became the preparation air of all school jumps. corresponds to what nowadays we call “terre à terre”. Another exercise mentioned by Fiaschi is the so-called “air with jumps and bounds” (“maneggio con salti a balzi”). It is difficult to understand how this exercise was performed. Pasquale Caracciolo talks about a jump called “balzotto” (little bound), but he does not explain what it was. According to Barry, this would be the one that was later called ballotade, a jump in which the horse jumps in a horizontal position and extends the hind legs, as if to kick, but not extending them completely. Indeed, the picture in Fiaschi’s book shows the horse with all four feet off the ground, but with the hind feet under his body. Today it’s hard to say what was the “air with jumps and bounds” mentioned by Fiaschi. was also called “vigorous canter”. 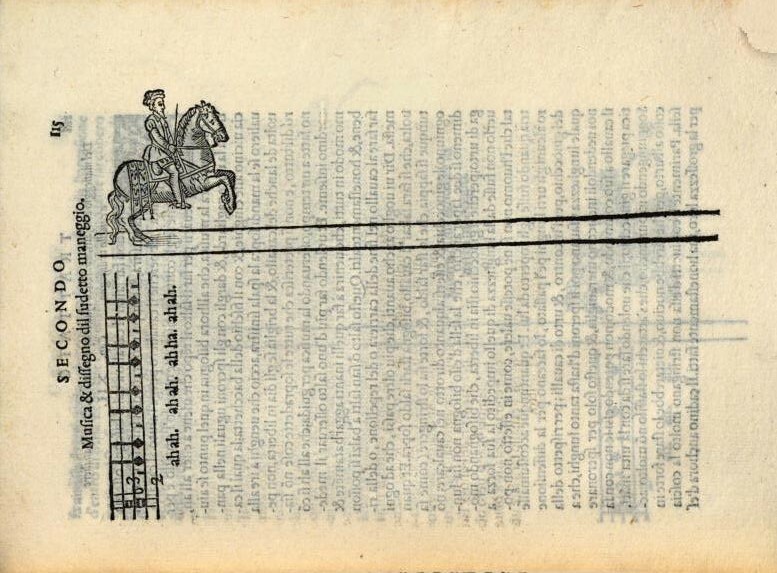 because when the horse makes the jump and bound, he pushes his waist forward, while doing the ram jump as it should, it is necessary that he falls straight in the place from where he lifts, going even higher (FIASCHI, 1556, II, 15, p. 122). In the “ram jump” the horse kicked and fell back on the spot. When you want to make the horse perform a cabriole jump or some jumps, which are so called because the goats [“capre” in Italian] jump in this way, you have to make him do as they do when they jump, that when they fall to the ground they raise their haunches (FIASCHI, 1556, II; 16, p. 124). In the Sixteent century, in the cabriole, the horse kicked in the descending phase of the jump. The “corvetta” (courbette) was also very popular. This is a school jump in which the horse raises the forelegs and then proceeds bounding on his hind legs. 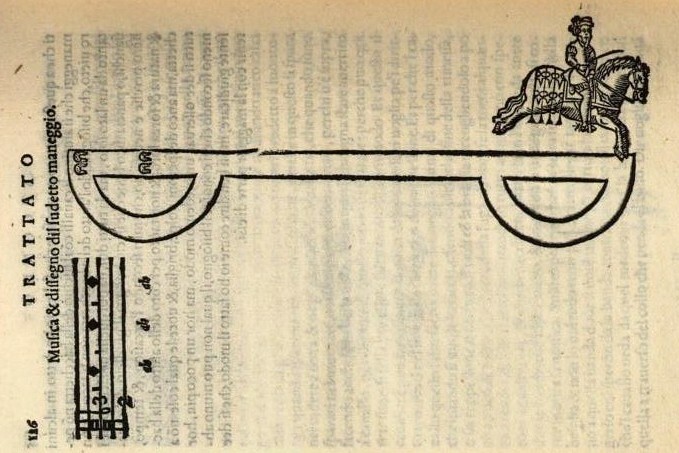 According to Corte, this characteristic movement would be at the origin of the name, since “we say corvetta from the raven [“corvo” in Italian], that when he is on the ground he goes forward with small bounds” (CORTE, 1562, II , 15, p . 72r ). It was considered a presentation air par excellence and was often performed during public cavalcades as an act of gallantry in the presence of ladies. as an act of gallantry in the presence of ladies. The horses were also trained at “kicking”, as a preparation for school jumps. 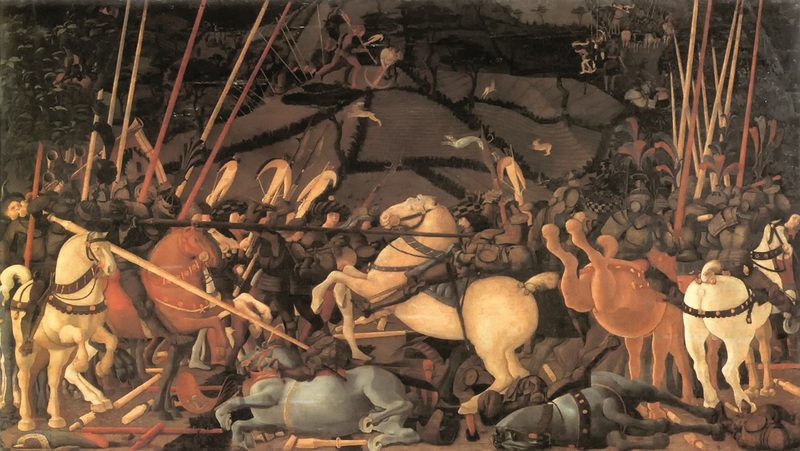 It should be considered that this kind of training was also shared by war horses, which were induced to kick on command in the melee, as shown in a detail of the famous painting by Paolo Uccello, Bernardino della Ciarda unhorsed (1438-1440), in which a chestnut horse is portrayed in the act of kicking with his hind legs. a chestnut horse is portrayed in the act of kicking. 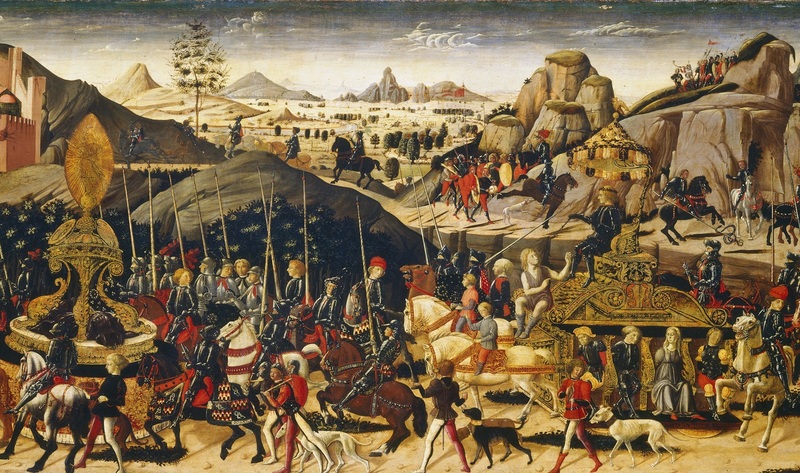 This concise discussion of the presentation airs concludes our survey of the main exercises described, or mentioned, in the Italian equestrian treaties of the Renaissance (see the previous articles: Part 1 and Part 2). Obviously, this concise description does not purport to exhaustively represent the vast field of the equestrian practices of the time, but primarily aims to highlight some aspects that have remained unchanged over the centuries, as well as to point out some significant differences. BARRY, Jean-Claude, Traité des Airs relevés, Paris, Belin, 2005. BARRY, Jean-Claude, Les airs relevés et leur histoire, in AA.VV., Les Arts de l’équitation dans l’Europe de la Reinassance. VIIe colloque de l’Ecole nationale d’équitation au Chateau d’Oiron (4 et 5 octobre 2002), Arles, Actes Sud, 2009, pp. 183-196. CARACCIOLO, Pasquale, Gloria del cavallo, Venezia, Gabriel Giolito de’ Ferrari, (in 4°), 1566. FIASCHI, Cesare, Trattato dell’imbrigliare, atteggiare e ferrare cavalli, Bologna, Anselmo Giaccarelli, 1556. 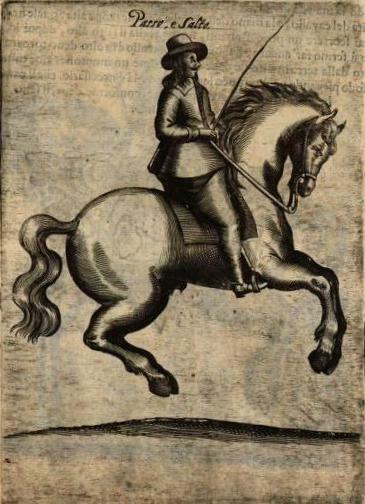 GALIBERTO, Giovanni Battista, Il cavallo da maneggio, ove si tratta della nobilissima virtù del..,Vienna, Giacomo Kyrneri, 1650. Merci Corinne. Votre appréciation me rend très heureux. J’ai lu votre beau livre sur Les académies d’Art équestre dans la France d’Ancien Régime j’ai trouvé cela très intéressant. Brilliant topic; excellent content, and well written. And I was beginning to think I was the only one left!